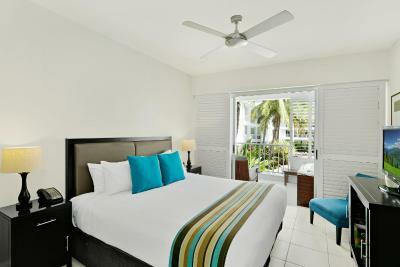 Lock in a great price for Peppers Beach Club & Spa – rated 8.9 by recent guests! Breakfast was excellent. Facilities were ideal. Bed very comfortable. Loved it. 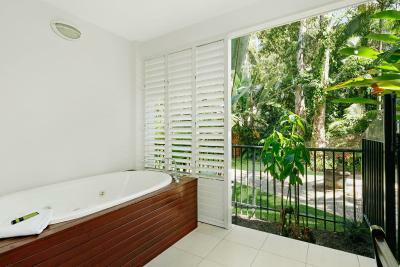 Beautiful quiet location in Palm Cove, close to everything shops, restaurants, beach, markets etc. 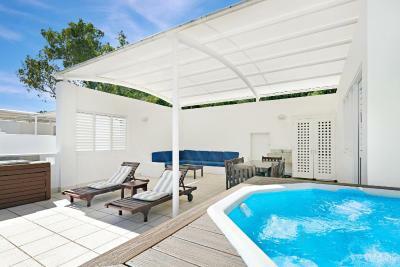 Lovely relaxing property which is great for a quick getaway to unwind. Lagoon pool is amazing way to spend a lazy afternoon drinking cocktails. 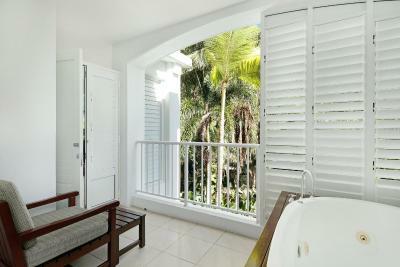 Rooms are comfortable and spa on balcony is fantastic. Room service was great quality. Amazing! I took my partner here for a birthday surprise! We were allowed early checkin and received a complimentary bottle of wine, waiting for us in our room. The pool is the best and the swim up bar was the highlight! 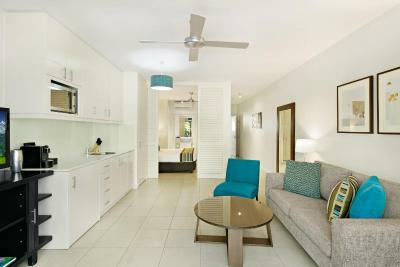 Great location - walk to everything in Palm Cove. Very comfortable bed and pillows. Good breakfasts with friendly restaurant staff & chefs. Lovely pool settings. Seating readily available. We stayed in wing with lifts which was good. 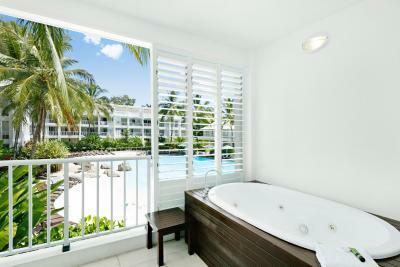 Peppers Beach Club & Spa This rating is a reflection of how the property compares to the industry standard when it comes to price, facilities and services available. It's based on a self-evaluation by the property. Use this rating to help choose your stay! 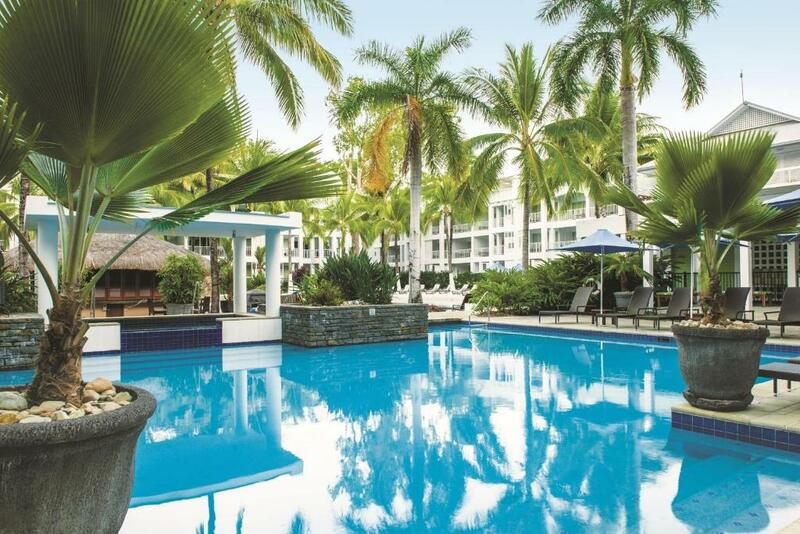 Located directly on the beach, Peppers Beach Club is a luxury resort in Palm Cove, offering elegant rooms, great leisure facilities and a fantastic spa pool in a tropical garden setting. WiFi and in-house movies are included. 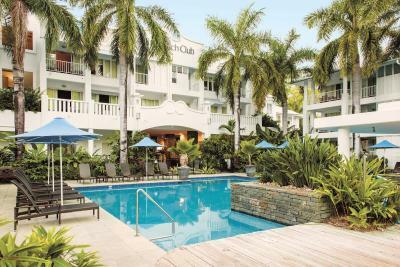 Peppers Beach Club and Spa is now providing guests with access to the latest release movies with two latest release movie channels and a designated children’s movie channel. 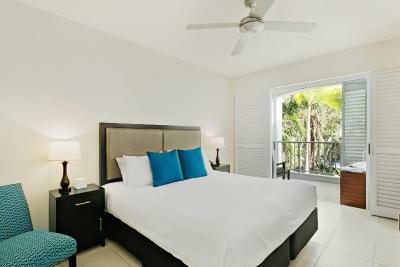 Choose between comfortable guest rooms or the larger suites which have a separate living/dining area and a fully equipped kitchen. 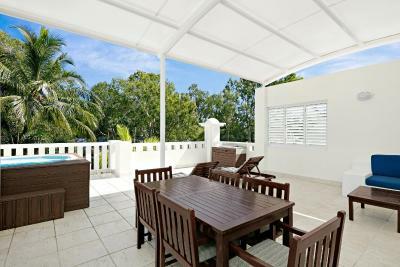 All units have a balcony or terrace overlooking the ocean, pools or gardens. 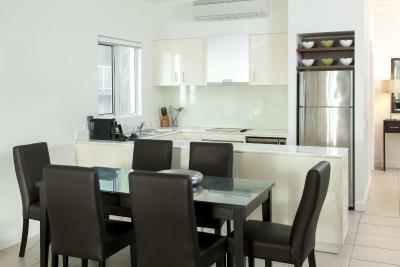 Facilities at Peppers include 3 swimming pools, a tennis court and a fitness center. 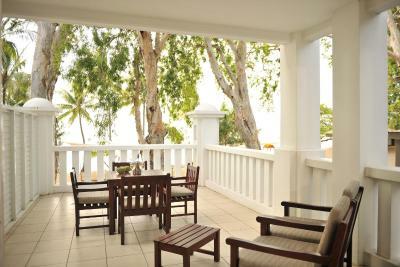 The beachside restaurant is open for breakfast, lunch and dinner and serves modern Australian cuisine. 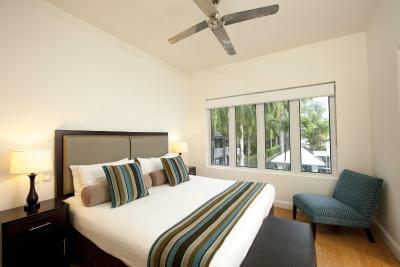 Peppers Beach Club & Spa is within easy reach of the Daintree Rainforest and the Great Barrier Reef. A great choice of day trips are available, as well as scuba diving, deep-sea fishing and rainforest walks. 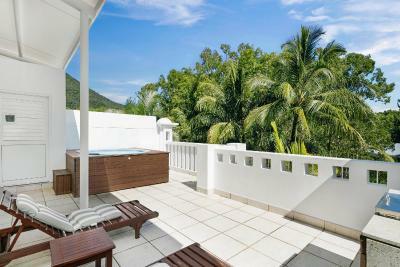 뀐 Located in the top-rated area in Palm Cove, this property has an excellent location score of 9.5! 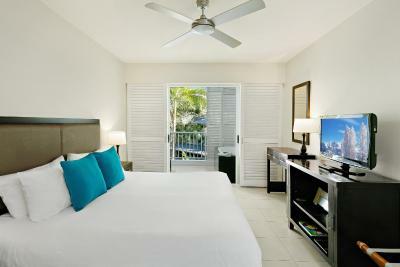 When would you like to stay at Peppers Beach Club & Spa? 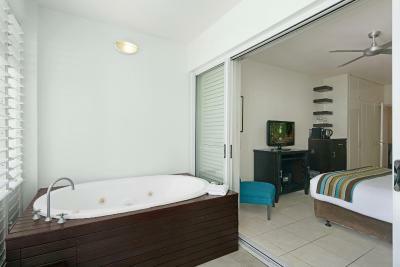 Located near the rainforest garden or swimming pool, this room features a balcony with a 2-person spa bath. 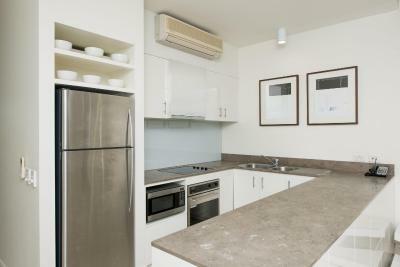 It includes tea/coffee making facilities and an private bathroom with a shower. Please note that the price is based on 2 guests only. There is no capacity for additional guests, including children or infants. Please note some rooms have stair access only. 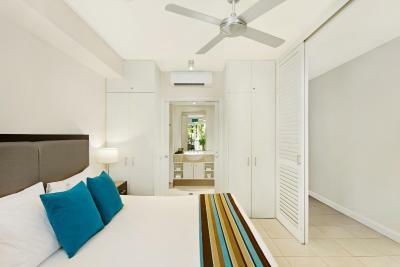 Located near the rainforest garden or swimming pool, this suite features a balcony, a fully equipped kitchen and laundry facilities. Please note that a roll-away bed is available on request, however charges apply. Please note that the price is based on 2 guests. Maximum occupancy is 3 including children and infants (see Hotel Policies). 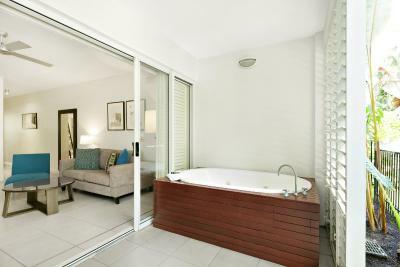 Self-contained suite with 2 bathrooms and a separate living-dining area plus full kitchen. 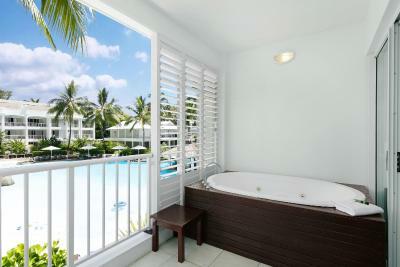 There is a furnished balcony with a spa bath. This is an interconnecting dual-key room. 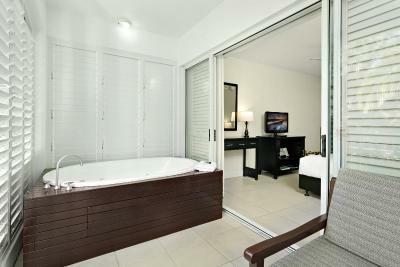 This suite features spa bath, 2 bathrooms a fully equipped kitchen and laundry facilities. 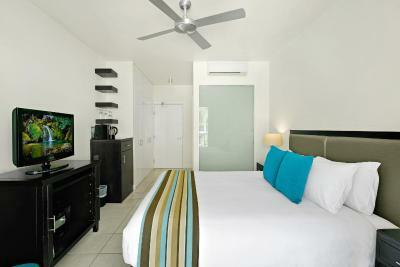 Rooms are 140 square yards. House Rules Peppers Beach Club & Spa takes special requests – add in the next step! Debit card Peppers Beach Club &amp; Spa accepts these cards and reserves the right to temporarily hold an amount prior to arrival. Peppers Beach Club & Spa accepts these cards and reserves the right to temporarily hold an amount prior to arrival. Buffet breakfast very average & poolside food. Rooms ok but on the small side & starting to look tired. Nachos were made with the same Mexican bean mix served in breakfast, makes you wonder! No lift access to room. 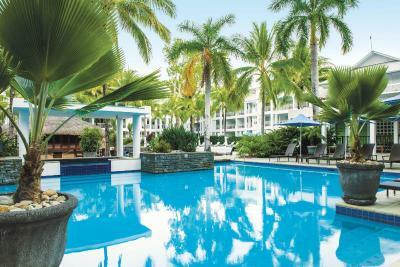 The pool area was amazing and the tropical surrounds. 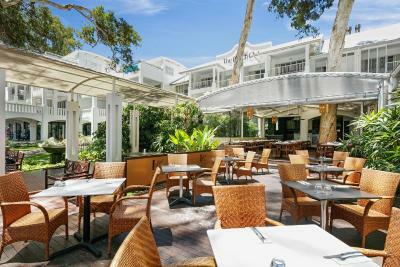 Lovely breakfast, well priced drinks at the swim up bar, very friendly and accommodating staff. 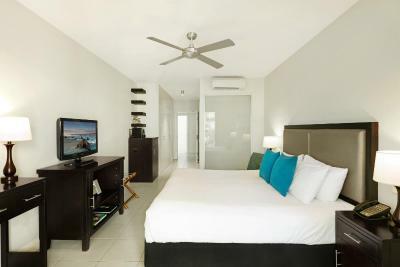 The location is ideal for walks on the beach or easy trips for shopping. Did not want to leave! 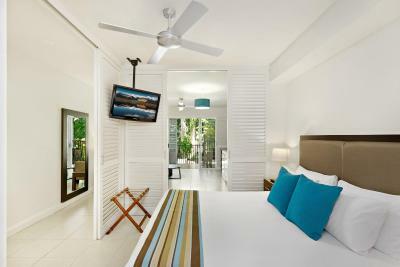 Our rooms were in need of painting & the courtyards could be cleared of leaves etc so they were more inviting to use. Dinner in the Lime & Pepper was awful flavours that didn’t go together, good customer service they took it off the bill. Breakfast was disappointing, not much variety and not enough space for diners every morning, some mornings we had to queue to get seats. 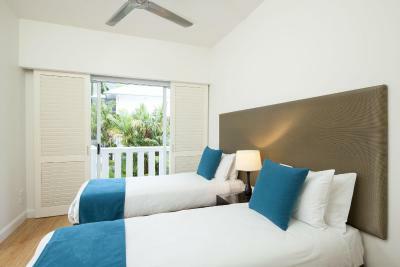 Unnecessary expenses, we paid a lot of money to stay at the resort and had to pay for amenities such as a portacot and decent coffee from the breakfast buffet, these things are complimentary at all other hotels. We were really looking forward to making the most of the swim up bar however it was only open for about 2 hours out of the 4 days we were there. The bar was closed early on day 1 and the guy working gave us the number of the bar inside to call to deliver us drinks. We did this once however were then told (in an unpleasant manner) by the girl who brought our drinks out that we were to go inside and get the drinks ourselves and that they wouldn’t bring them out again. This was frustrating and did take away from the wonderful resort experience. Perfect location. Incredible pool area. Visited the day spa which was out of this world good! Room was super comfortable and everything we needed. No information in Rooms, or even a Price list for Mini Bar Goods. Wet Slippery paths back to Units . Very Good, but dining area a bit small to cater for all Guests, when Coach loads use it too for Breakfast. Staff very accommodating. 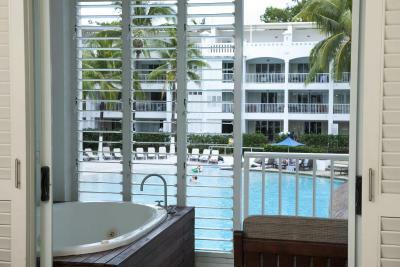 Beautifull romantic hotel with a wonderfull swimmingpool. Just next to the beach. Perfect. Room service menu was extremely limited. Rooms were clean and bed was very comfortable.